There is a lot of talk about our state’s gun laws being unreasonably strict, and it’s hard to argue with this opinion. Hundreds of otherwise law-abiding citizens are arrested each year for serious gun violations that would not even be crimes in most other states. The state firearm laws receive a great deal of attention, but it is often overlooked that the state dangerous weapon laws are similarly harsh. And to make it worse, these laws are confusing to the point that the public simply does not know what is legal and what is illegal. The law defines a large number of different types of weapons that are prohibited, but does not do a great job of detailing what defines each type of weapon. The problem with this is that not only are citizens confused about the laws, but police officers end up being confused as well. When a cop is unsure about the law, he or she will generally err on the side of caution, and unfortunately this means making an arrest or issuing a citation. Attorney Benjamin Herbst handles all types of criminal offenses, and if you or a loved one is facing misdemeanor dangerous weapon charges Benjamin can help. He understands the laws and knows how to fight for his clients in court, because he has done it successfully so many times in the past. Call 410-207-2598 for a free and honest consultation about your case. There are a few main types of weapons that fall under this statute, which is section 4-101 of the Maryland criminal code. Upon conviction a defendant faces up to three years in jail and a fine of $1,000, but unlike the handgun laws there are no minimum mandatory sentences. Knives are clearly the most common type of weapon for this charge, and they are also the source of the most confusion. To be precise, the law only prohibits switchblades, star knives, bowie knives, and dirk knives but few people and police officers actually know the exact differences between each. 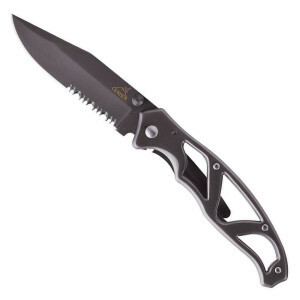 A switchblade or automatic knife typically has a button that deploys the blade, while dirk and bowie knives do not have any type of buttons or folding mechanisms. Star knives are also called throwing stars, and are rare but widely recognized from various ninja movies. Penknives, which include pocketknives and non-automatic folding knives are the most common type of knife regularly owned and carried, are not illegal under this statute. But just because they are legal does not mean a cop will look the other way if he or she finds one. Penknives are often the root of many unlawful weapons arrests, and these cases require skilled representation in order to assure their dismissal. To the surprise of many, Mace and other types of pepper spray are also included in the dangerous weapons statute. The law provides a defense against this particular violation, but sadly needing to use a defense means that and arrest was made or citation issued. A cop typically will not initiate charges for someone carrying a small cased pepper spray on a key chain or in a pocketbook, but it does happen, and there is no guarantee that the case will be dismissed or dropped before court. Various types of clubs and less common things like nunchaku are also prohibited under 4-101. Dangerous weapon charges are also common in Ocean City where we have seen numerous wrongful arrests. Inexperienced police officers could easily arrest a person under the municipal ordinance that makes possession of an assisted opening knife illegal, when in fact the weapon is a legal penknife. Ocean City law prohibits possession of other martial arts weapons under division 2 section 58-121 of the city code such as metal knuckles (commonly called brass knuckles), batons and butterfly knives. A violation of this set of laws could land a defendant in Worcester County jail for up to 6 months, so it's important to have an experienced lawyer with you at the district or circuit court.